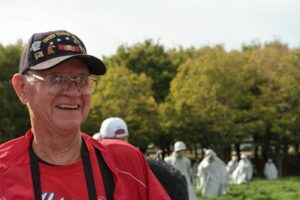 Honor Flight is dedicated to honoring our veterans with a free trip to Washington DC to visit their monuments and memorials. These memorials were built to honor their service, and we believe it is imperative they have the opportunity to see them. NOTE: Veterans must apply for flight selection prior to the published deadline date for each flight. Only veterans selected from applications on file may travel. Is The Next Flight Full? We get this question a lot, and the short answer is “Yes.” But that doesn’t mean you can’t fly. Due to the extremely high cost of our charters, we will not fly a flight that isn’t full. Our database contains many more veterans waiting for a flight than can fit on a single charter aircraft. Each flight is filled from this database, following the selection criteria noted below. One-day trip to Washington DC with visits to the National WWII Memorial and Korean War Memorial. Additional stops at other monuments and memorials may also be included. Veterans pay nothing for the trip. 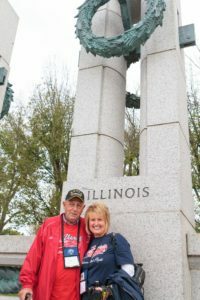 Veterans Honor Flight of Southern Illinois covers airfare, bus fare, entry fees, food, and supplies. Veterans must apply to be selected for a flight. Deadlines for specific flights apply, generally 30 days prior to flight date. Applications are accepted online and by mail using our Veteran Application. Within each group, veterans are selected based on age, oldest to youngest. A service member that served in the periods not included above (cold war veterans) are still eligible to participate. To be clear, ANY person (male or female) that has worn the uniform of the US military is eligible to receive a free flight including those that have served in the US Reserves and the National Guard. All veterans must submit a copy of their DD-214 before their application will be activated in our system, the dates shown on the DD-214 are used to determine eligibility, based on the dates above. All veterans are assigned a guardian during flight day. Guardians are responsible for ensuring the safety of our veterans. This includes wheelchair assistance, if necessary. Veterans are NOT disqualified from a flight for any medical reason other than a medical order not to travel. Honor Flight does everything in our power to ensure every veteran gets to fly, including working with your physician. For complete Guardian information, visit our Guardian Page. Veterans requiring mobility assistance will be provided a wheelchair by Veterans Honor Flight on flight day. Veterans are not allowed to bring their own wheelchairs, walkers, or scooters for safety purposes. Veterans may bring a cane. Veterans do not have to request a wheelchair in advance, extras are taken on each flight to ensure any veteran may use one if he/she wishes. Once a veteran application is received by our office, a letter is mailed to the veteran requesting a copy of the DD-214. Once the DD-214 is received, the veteran is placed on our active list. Flight slots are filled from this active veteran list. NOTE: If a veteran wishes to fly with a guardian of his/her choice, this MUST be noted on their application. If a guardian is not noted on the application, Veterans Honor Flight will assign a guardian. Veterans selected to fly are contacted approximately four weeks prior to the flight date. The veteran must provide confirmation that he/she is available and able to fly on the flight date. Assuming the veteran is able to fly, he/she must attend a medical evaluation approximately two weeks prior to the flight date. This evaluation provides our medical staff the necessary information to render care on flight day and is NOT a selection criteria. No veteran will be removed from the flight as a result of this medical evaluation. Active veterans who are not selected remain on our active veteran list and will be eligible for selection on a future flight. Due to the amount of planning which goes into each Honor Flight, we must adhere to strict deadlines. Deadlines for each flight are posted on our calendar and on social media.